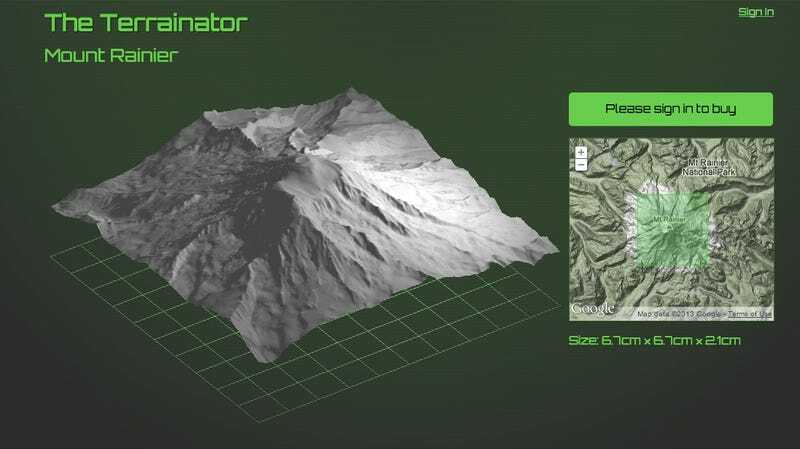 If you want a permanent reminder of an amazing hike, ski trip, or whatever else, here's a good idea: a new website called The Terrainator lets you select your favourite geographical features and get 'em 3D printed. I've had the good fortune to be able to visit some gorgeous places over the last few months, including Yosemite in California, and Tignes in the French Alps. Having been steeped in the world of 3D-printing at MakieLab last year, I naturally wondered whether I could make tiny scale models of these places to remember them by. So... he decided to build a website to offer that exact service. You simply find the area you're interested in on a Google Map, and then Wilson's site creates a 3D model which can be printed for you. A small, three-inch square model costs in the region of $45.